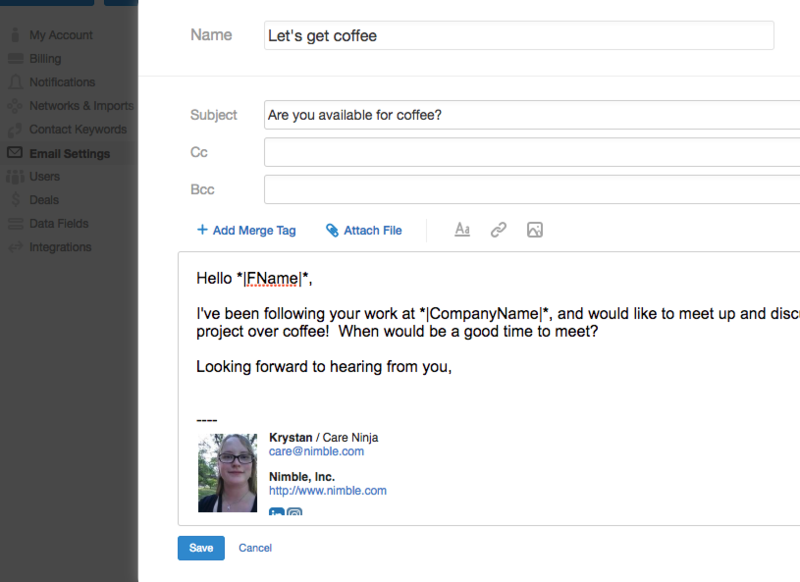 Nimble allows you to send targeted email messages to 100, 200, or 300 contacts per day. This is a great way to send targeted sales outreach or marketing messages to lists of your contacts. All messages are sent over your personal email address' SMTP, so they will appear as if they were sent from you, not an email marketing system. For now, our grandfathered ($15 per user, month) users are limited to sending up to 50 messages per person, per day, with the clock reset at midnight in your time zone. All Nimble accounts on our $25 per user, per month pricing plan will be able to send up to 100 group messages per person, per day. Office 365 Users: This current release will limit you to only 100 Group Messages per day before you are cut off. This is due to limitations on bulk sending from Microsoft. Google Apps/Gmail Users: You should not have any issues sending up to 100 messages per person, per day. See more about Google SMTP limits here. Third Party Email Providers: Daily SMTP limits will vary depending on your provider. Please contact your email provider for more details. 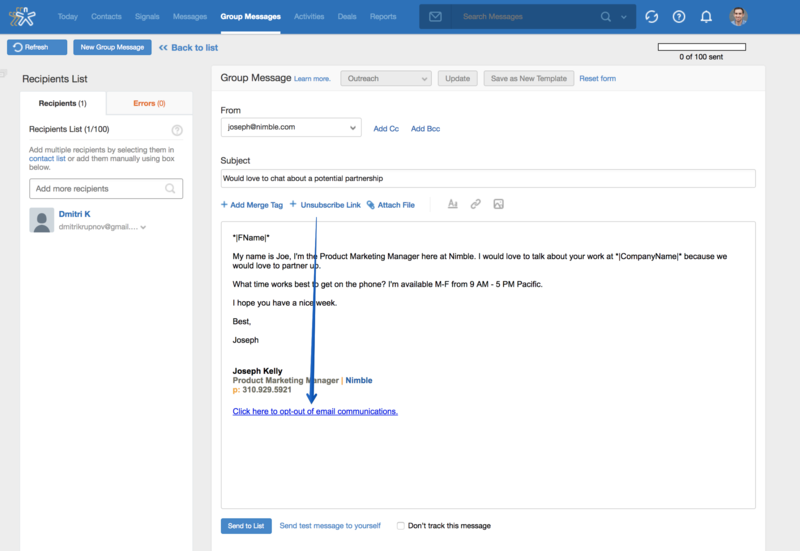 Once you add a group of contacts to a message, you can select a template, write your custom message, select which email address you wish to send from, and insert text formatting into your message. Include hyperlinked text for your email and websites in the body of your message. 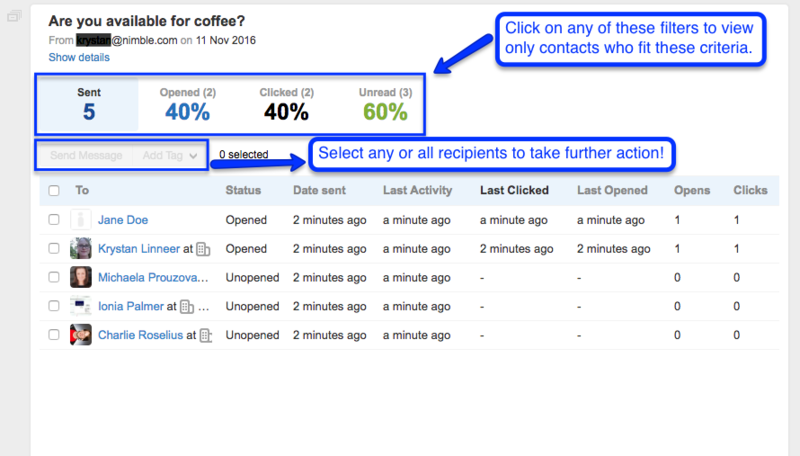 This will allow you to track clicks on group messages sent from Nimble. Merge tags (a.k.a. 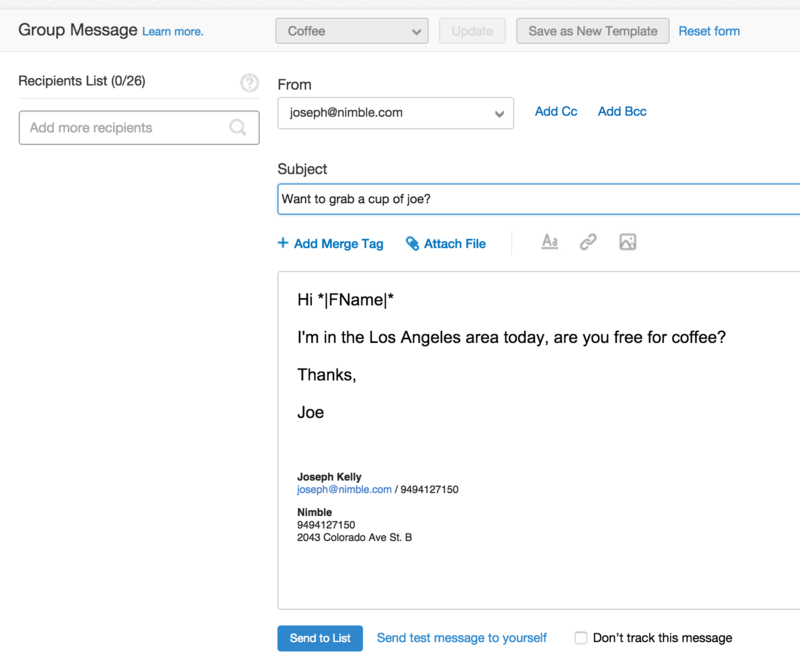 variables) make it easy to personalize messages that are sent to larger lists. This way, your message will look like you have done your homework and you're worth their time. Note: We only support specific fields for merge tag, we do not support all contact fields. Once you save your hyperlink, it will appear in the body of your Group Message. Once your contacts are added, select "Send to list" to send out your message. You may also choose to send a test message to yourself to see what it looks like, as well as whether you would like to track this message. 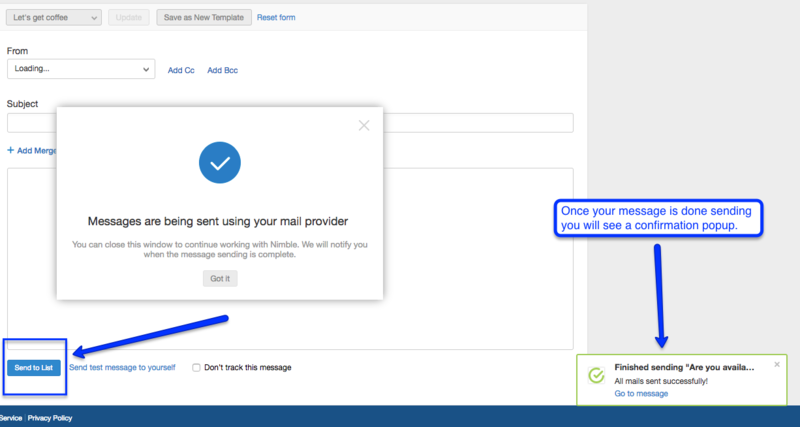 To save a message as an email template for future use, select "Save as New Template" before sending your new message. If you would rather pre-create a bunch of email templates, go to Settings >> Email Settings and select "Add Template". This will bring up our template editor, where you can insert all of your email fields, including attachments and merge tags. Once you create a template, it will be available beneath the "Select Template" option on the Group Message screen. Our Group Message Reporting Dashboard displays an overview of tracking information for each sent group message. This includes how many messages were sent, when the last activity occurred, and your open and click rates for each message. To access your Group Message report, go to your Group Messages tab. Click on the subject of any sent group message, and our reporting dashboard will display the contacts you’ve sent to, who has opened or clicked in your message, when it happened, and how many times they’ve done so. Additionally, you may view who has not yet opened your message. You can also take further action from your group message reports to send follow up messages or tag contacts. At the top of the report, select some (or all) recipients, and click “Add tag” to tag these contacts for later, or click “Send Message” to send a follow up email. 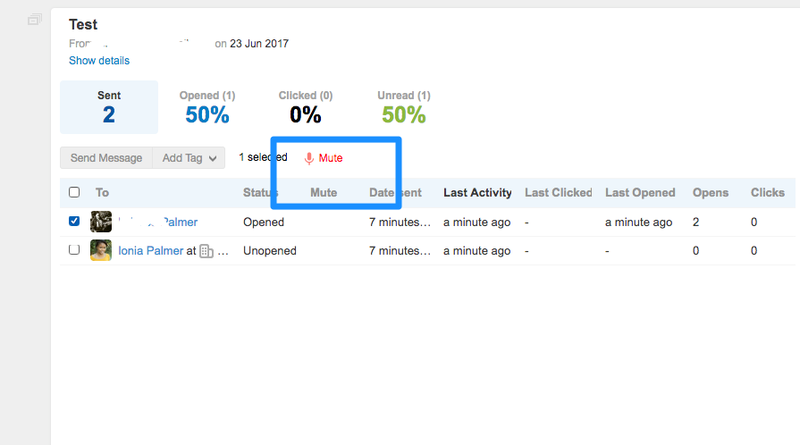 If you are receiving too many open/click notifications from a particular contact, you may choose to mute the conversation. Simply select the contact you would like to mute. The word "Mute" will then become active and appear in red. Click on the word "Mute" to determine how long you would like to mute the conversation. When you are ready to turn on notifications for this contact, simply select the contact again and click "Unmute." The "Mute" option is available for in-app, Gmail and desktop notifications. Opens/Clicks tracking will still be counted in the background. To ensure you follow up at the best time, we give you the option to enable in-app and desktop notifications for Group Message opens and clicks. To enable this, navigate to Settings >> Notifications and check the box to enable desktop notifications. Once Desktop Notifications are enabled, you will see notifications whenever a recipient opens or clicks in your message. Click on the notification to see the message report so you may engage with your contacts at the right time. If you are sending an unsolicited email, it's always important to make sure that your recipients can opt-out of an email. This is especially important to comply with CAN-SPAM and GDPR. Insert the "Unsubscribe" merge tag into your email signature with a message such as, "To unsubscribe, please reply with "Unsubscribe" in the subject line". How can I check my total number of messages? At the top of the "Recipients list", we show a count of how many messages you have left for the day. There is a second counter towards the top right-hand corner of the Group Messages tab.